There's a Proustian sense in which some of the names of places I know come to resemble them, or at least to evoke a sense of my being there. Thus, for example, in Norfolk, Salle is tall, majestic and lonely. Barford is rugged and intensely rural. Hardley is hardly there at all. Sometimes the name has stood for a place before I have visited it, creating a picture of what to expect. The problem comes, of course, when two very different parishes share a name. For me, Hempstead has always been a lost, lonely church out in the green fields on the edge of east Norfolk, a slightly sad place with its fabulous medieval Saints on the rood screen. To come to another Hempstead just wouldn't do at all, I had no idea of what to expect here. 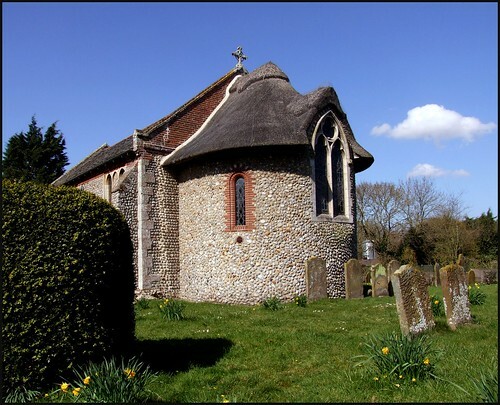 In the secretive green valleys of north Norfolk on a beautiful early spring day, we came down the winding lanes into a narrow little village, and there at the junction stood this funny little church on its mound. You approach from the east, and this is a thatched round apse, as pretty as if Hansel and Gretel were imprisoned inside. Walking around the graveyard presents a building which is no less odd in other aspects, with a functional red brick tower offset so far in the north-west corner that it is barely attached, and a nave in the middle which looks entirely Victorian. The apse dates from the 1920s, and what is now the nave was obviously once a south aisle. The body of the original church has completely disappeared. There is always going to be a slight disappointment when you step inside a building which is externally so quirky, but the interior is pleasant enough, and welcoming. The east end is lovely, a beautiful survival of early 20th Century High Anglican piety. A couple of curiosities predate all this later enthusiasm. At the west end is a lovely rustic gallery, and if you climb up to it you not only get a fine view of the interior, but you can see the graffit cut here, probably by the musicians in the 18th and early 19th centuries before organs made such players redundant. A brass plaque for Sir Edward Hunt in the nave contains a very grandiloquent valediction in Latin, which is helpfully translated on a sign below. It is dated 1610, but feels the work of several decades earlier; here is one of the last fruits of early modern English education before the furious wind of puritanism blew us all back into ignorance, superstition and an inability to spell. It would take nearly a century to recover.